(APN) ATLANTA — On Friday, March 13, 2015, the Georgia Senate passed SB 185, a medical cannabis research bill, which provides for clinical trials of cannabidiol-containing products to treat Georgia residents under 18 who have medication-resistant cases of epilepsy. It passed the full Senate by a vote of 54 yeas and one nay. The only nay was State Sen. Curt Thompson (D-Gwinnett). Sen. Thompson’s bill, SB 7, the Therapeutic Relief Act, was more comprehensive and a better approach to medical marijuana than SB 185 or even HB 1. As previously reported by Atlanta Progressive News, advocates preferred Thompson’s medical bill, SB 7, to State Rep. Allen Peake’s (R-Macon) HB 1. However, SB 185 is so watered down and pitiful that it makes HB 1 seem substantial. SB 185 grants immunity for children already in a study currently being conducted by Georgia Regents University. It only allows three percent THC in the study group while the House bill, HB 1, allows five percent THC. Three percent THC is considered too low to be medically effective, but the irrational hysteria around higher percentages of THC by some Georgia legislators is blocking scientific evidence. HB 1 would also allow for the treatment of nine different medical conditions with cannabis oil. The nine diagnoses are: cancer, ALS, seizure disorders, multiple sclerosis, Crohn’s disease, mitochondrial disease, fibromyalgia, Parkinson’s disease, and sickle cell disease. It would encourage medical refugees from Georgia’s repressive laws the opportunity to return home. Law enforcement officers, whose job security may depend on keeping prohibitions on cannabis, are also not supportive of expanding medical cannabis to other illnesses or higher levels of THC in the oil. In essence, SB 185, does nothing but wrap medical cannabis in bureaucratic red tape and study groups for years, while Georgians continue to suffer and die without the medicine they need. Not to mention the fact that Georgia has had a medical cannabis program on the books for 35 years that it has never implemented, as previously reported by APN. “There is no need for another study group, it [cannabis] has been studied for thousands of years. The science is already there and has shown that the medicine has never killed anyone, but has helped an array of illnesses. Georgia does not need to recreate the wheel,” Dr. Uma Dhanabalan, a Cannabis Therapeutic Specialist, with a Master’s Degree in Public Health from Harvard University, said in an interview with Atlanta Progressive News. Even though cannabis is listed as a schedule one drug, which the U.S. government purportedly considers the most dangerous drugs with no medical benefits, the U.S. government has a patent #6630507 on cannabis. It lists cannabinoids found within the plant as useful in neurodegenerative disease such as Alzheimer’s and Parkinson’s diseases and HIV dementia. “The categorizing of cannabis as a schedule one drug is purely political. The government is lying to the American people. This medicine should not be on any schedule, ” Dr. Dhanabalan said. On March 10, 2015, U.S. Sens. Cory Booker (D-NY), Rand Paul (R-KY), and Kirsten Gillibrand (D-NY) introduced a bill to end the federal ban on medical cannabis. It would downgrade marijuana with the Drug Enforcement Agency from Schedule 1 to Schedule 2. U.S. Sen. Dean Heller (R-NV) joined as a co-sponsor on March 11. “Doctors, not politicians, should be determining how cannabis should be used and which patients should use it. 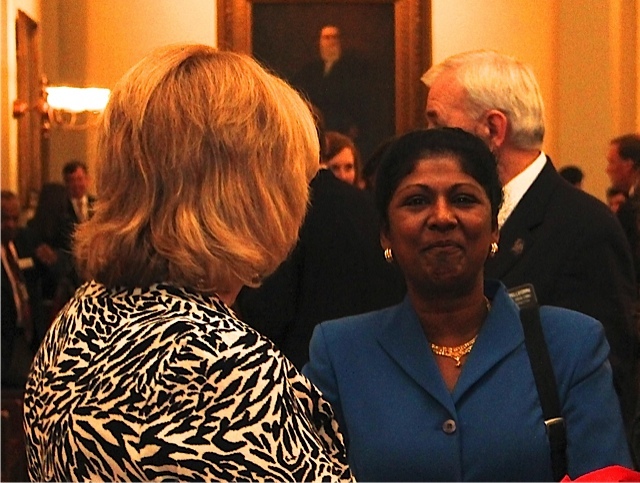 Patients need safe access to medicine and have their health information protected,” Dr. Dhanabalan said. State Rep. Peake hopes that both chambers can reach an agreement to include the nine conditions outlined in HB 1. “SB 185 excludes thousands of our citizens who suffer from medical conditions beyond epilepsy and could benefit from cannabis oil, and the immunity language in the bill does not bring our medical refugees home. 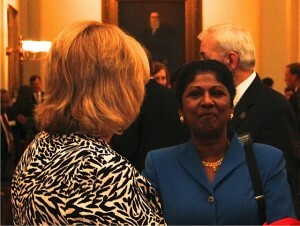 That remains my top priority and commitment,” Sen. Peake said in a statement. HB 1, passed the full State House on February 25, 2015, with 158 yeas and 2 nays. The two nays were State Reps. Darlene Taylor (R-Thomasville) and Darrel Ealum (D-Albany). “HB1 is a good start, but it does not allow for in-state cultivation or for whole plant medicine. The whole plant has over four hundred chemicals and over eighty different cannabinoids. We need the whole plant not just bits and pieces of the plant,” Dr. Dhanabalan said. “Cannabis in not an entrance drug; it is an exit drug from dangerous pharmaceuticals and narcotics. We must educate the public, legislators, and health care providers to remove the stigma and myths to achieve necessary reforms. Cannabis should be a first option, not a last resort in patient care,” Dr. Dhanabalan said during her visit to Georgia to educate for medical cannabis reform. “The U.S. is five percent of the world’s population and yet we consume eighty percent of opioid prescriptions for chronic pain,” Dr. Dhanabalan said. These opioid prescription drugs destroys the liver and adversely impact the whole digestive system. Patients build up a tolerance and take more and more until they may overdose and die. Cannabis medicine does no harm and can get people off these dangerous pharmaceutical opioid drugs. Below is a link to overdose statistics by the Center for Disease Control (CDC). SB 185 is sponsored by State Sens. Lindsey Tippins (R-Marietta), Sen. Renee Unterman (R-Buford), Sen. Fran Millar (R-Atlanta), Sen. Bruce Thompson (R-White), Sen. Butch Miller (R-Gainesville), and Sen. Judson Hill (R-Marietta). “I am… grateful that the Governor’s floor leader, Senator Butch Miller, will be carrying HB 1 in the Senate. However, I am hopeful that our chambers can reach an agreement on this issue and get a bill to the Governor as soon as possible. We must ultimately pass legislation this session that works to bring medical refugees home and offers protection for Georgians,” Peake said. My name is Jenny Clarke, I live New Zealand. My Sister was diagnosed of melanoma cancer and she have done many chemotherapy and it did not work, the cancer keeps returning. A friend of the family told us about cannabis oil and its curing ability in treatment of any type of cancer. I purchased the cannabis oil from London by emailing londoncancercentre@gmail.com and they gave me instructions and a video recording disc to teach how to use the cannabis oil for the treatment of melanoma cancer. After using the oil for the duration of time given, my sister was totally free from cancer but i was advised she takes the oil continuously to maintain good health and reduce high blood pressure. I am so happy now that my sister is free from cancer and if you are suffering from cancer and the family is happy again. Cannabis oil is a natural treatment for cancer without any side effect. THIS IS SPAM!!! Every cannabis article with a comments section has this or some other scam running with it. The thin, distant anecdotal cases of remarkable cures from this or any other plant species run rampant across the internet. Mommy bloggers and amateur scientists do more harm than good by feeding the predatory internet sale of cannabis “oils” and “tinctures” with little or no active content. Excellent work is being done with cannabinoids and mapping the many thousands of interactions is an exacting science. Move from these repressive southern states, people. Get to a state where individual liberty is respected, and where nanny-state religious hypocrites who champion freedom only when it’s the kind of freedom they personally like (such as gorging on processed junk food at the church picnic and taking pharmaceuticals when they get diabetes) don’t have control over every aspect of your life. The south will likely never get with the cannabis program because there’s a lot of money to be made from jailing people over a plant that God made. Move, move, move, for your own safety and freedom! Georgia? I have been there many times and love the state and people. No disrespect intended but there is a serious lack of education & knowledge when it comes to marijuana, most folks are stuck with brain wash info from Nixon Regan era. Time to leave God out of. Open your eyes ears and brain. Educate yourselves Do your homework legalize it! nuff said. Well the cannabis oil will soon be medically indicated for 8 conditions. Unfortunately my pain is from fibromyalgia which was the only one out of 9 conditions that was removed from the list. I am more than ANGRY because the medicine that I take for pain LEGALLY is an opiate drug that causes liver damage. So I am suppose to continue to put LEGAL POISON in my body because LAWS AND DOCTORS say it is ok. WHATEVER HAPPENED TO SOME GOOD COMMON SENSE?!!!! I am so sick of backward, conservative thinking here in the SOUTH. I have lived on Atlanta all my life, but I think it is time to go WEST! Who decided that my pain all over my body does not qualify for medical help that won ‘t damage my liver and is not addictive like the opiate drug that my doctor prescribes?!!!!! Thanks for saying what I feel. They would rather treat me with poison that doesn’t really help. Those who took fibromyalgia out need to experience our pain for a day! I think it’s terrible that they can’t even come to agreement on passing the Fibromyalgia part of it, yet can include head traumas!? Am Tanya Albert am giving a testimony about Dr. Ekpiku the great Herbalist, he has the cure to all manner of diseases, he cured my herpes simplex virus, though I went through different website I saw different testimonies about different spell casters and herbalist, I was like: ‘Many people have the herpes simplex virus cure why are people still suffering from it?’ I though of it, then I contact Dr. Ekpiku via email, I didn’t believe him that much, I just wanted to give him a try, he replied my mail and Needed some Information about me, then I sent them to him, he prepared it (CURE) and sent it to Airfreight Online Courier Service for delivery, he gave my details to the Courier Office, they told me that 3-5 days I will receive the package and i took the medicine as prescribed by him and I went for check-up 1 week after finishing the medicine, I was tested herpes simplex virus negative, if you are herpes simplex virus patient do me a favor for you to contact him and I will try my possible best to make sure you get cured, when you contact him, make sure you tell him that I referenced you.. contact him via: ekpikuspelhomeofgrace@gmail.com or ekpikuspelhomeofgrace@hotmail.com call +2348073673757 OR whatsapp him ,or search the Google to know more of his product!! http://ekpikuspellhomeofgrace.blogspot.com/ THESE ARE THE THINGS Dr. Ekpiku. . HERPES . HIV/AIDS . CANCER . ALS disease.